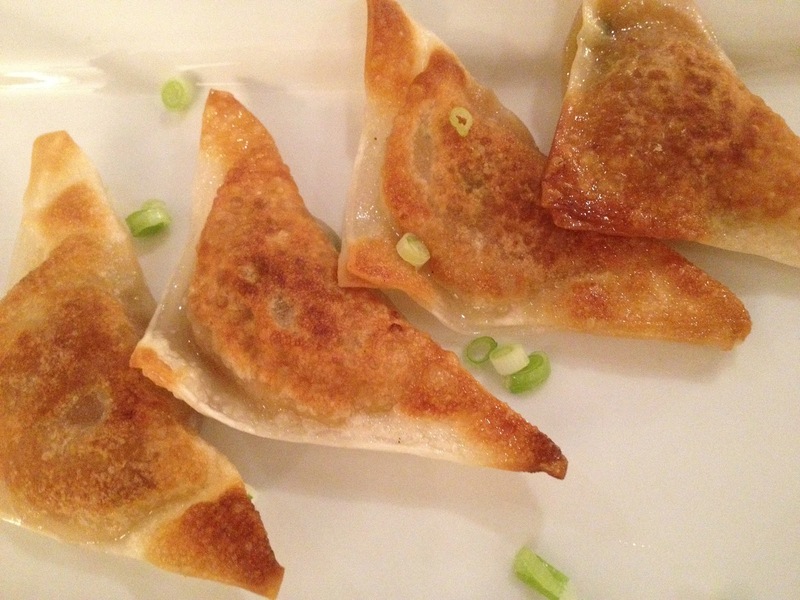 I love potstickers and I found this recipe on the Martha Stewart website while looking for ideas for butternut squash. I made a few changes and, of course, I made my dipping sauce from my potsticker recipe. Peel, deseed and cube the squash. Place into a saucepan with the tamari and sugar. Cover with water and bring to a boil. Cook until soft and drain. Mash with a potato masher until smooth. Thinly slice the scallion (both white and green parts) and add to the squash. Add the ginger and mix to combine. Set the wrapper down facing you in a diamond shape. Wet around the edge with your finger and place a teaspoonful of mixture in the middle. Pull the top corner to meet the bottom corner to make a triangle. Pick it up and press to seal the edges. Set on the plate awaiting the next step. This next part is the key to potsticker perfection: you have to add a little water, say 1/3 of a cup depending on your pan, and steam them with the lid closed for a minute or two to completely cook the wrappers. Hold the lid in front of you and pour the water in on the side and the close the lid. Let them steam for a two or three minutes. Take them out and drain them on a plate with a paper towel. You can dab the top too to get the excess oil off. Serve the with the dipping sauce (allow for double dipping.) They are great cold, too. Enjoy!